Boers, from the Dutch/German words meaning “farmer,” were a hardy, independent-minded people known for their dislike of governmental influence. In 1814, as a consequence of her victory in the Napoleonic Wars, Great Britain was formally ceded the Dutch South African territory of Cape Colony. Thus more than 160 years of official Dutch influence in South Africa came to an end. But in that time the white colonists of Cape Colony, a mix of Dutch, German, and French, had evolved into a new and distinct people known as Boers or Afrikaners. The Boers, from the Dutch/German words meaning “farmer,” spoke Taal, a variation of 17th-century Dutch that later became known as Afrikaans. Essentially farmers and cattle herders, the Boers were a hardy, independent-minded people known for their dislike of governmental influence and their hostile, racist attitudes toward the black South Africans, particularly the Hottentots. These traits would form the basis of the conflicts that arose between the Boers and Great Britain. In an effort to escape governmental influence and despite Dutch efforts to contain the colony, the Boers began to migrate farther away from the reach of authority, searching for new lands. This brought them into closer proximity with the Bantu nation, and led to near continuous conflict over territory and grazing rights. Never fond of the Dutch government, the Boers found themselves even less pleased with the new British government. The British attempted to put a stop to the fighting between Boers and black South Africans; they established policies designed to prevent whites from abusing the native population, particularly in regard to slavery. By 1838 the Boers had established themselves between the Orange and Vaal Rivers and along the borders of Natal where they declared several small republics, among which was the Transvaal. In the process of their migration they came into conflict with another South African nation, the Zulu, and the usual series of white and black conflicts began again. In 1854 the Boers gained their independence from Britain with the establishment of the Orange Free State. For the next several decades the Boers managed to keep enough of a low profile that the British had no reason to encroach on their territory. The situation in the Transvaal, however, never very good to start with, grew progressively worse. By 1880 British influence in the Transvaal had reached a state of intolerance among the Boers. 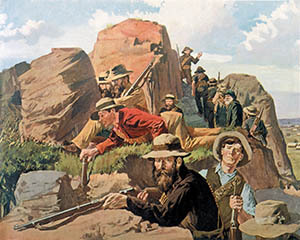 The discovery of diamonds and gold in various parts of the area had led the British to annex parts of the region in 1867, despite the vehement protests of the Boers. The free-spirit lifestyle of the Boers, their refusal to pay taxes, and the constant infighting among their leaders resulted in near political anarchy and the emasculation of their government. To add to their problems, the Bapedi tribe and the Zulus were massing on the borders for an invasion. Further, despite the law the Boers were still practicing slavery, albeit hidden under a policy of “apprenticeship.” The law allowed orphaned black children to be provided for by apprenticing them. These children usually became “orphans” because the Boers killed their parents or they were kidnapped after a raid. Affairs in the Transvaal had reached such a state that the British believed they had no choice but to intercede to save the republic from complete disaster. Therefore, in April 1877, Britain annexed the Transvaal. By 1879, Boer distaste for British autonomy had led to open defiance of the Crown’s authority, and the British subsequently established fortified garrisons across the country to control a possible Boer uprising. On December 16, 1880, their attempts to peaceably regain an independent status having been frustrated by the unyielding attitude of the British government, the Boers proclaimed a republic in the Transvaal. Almost immediately hostilities flared up as the Boers attacked any British troops who refused to evacuate the newly declared republic. The Boers, under the leadership of S.J. Paul Kruger and Petrus (“Piet”) Jacobus Joubert, had managed to muster an ad hoc force of nearly 7,000 men to drive the enemy from their home. On December 20, a British column on its way from its garrison at Lydenburg to the capital at Pretoria was ambushed at Bronkhorstspruit by a Boer commando unit (local militia) of some 250 men. The Boer Wars were set to officially begin. Tags Afrikans, Cape Colony, first anglo boer war, German, Hottentots, Militia, napoleon, Napoleonic Wars, Pretoria.